Peas are easy to grow and thrive in the cooler temperatures of spring and fall, making them a popular choice among both new and experienced home gardeners. We offer three varieties of pea plant seed varieties to suit specific tastes and growing environments. Sugar Ann Snap pea plants feature bushy vines that produce an edible pod. They are well-suited for small gardens and don’t need support. The Oregon Sugar Pod is a favorite snow pea that also features sweet, edible pods. It benefits from being staked or trellised. We also offer a popular shell pea (also known as an English pea): Little Marvel. Peas—Pisum sativum—are an annual vegetable (make that fruit—actually) and member of the legume family (Fabaceae or Leguminosae). Other members of this very large family include beans, chickpeas, peanuts, clover, and alfalfa, to name a few. There is evidence that peas are among the oldest cultivated vegetables in the world going back to 9750 BC. Their consumption by humans has been traced back to an area between Burma and Thailand. Archeological excavations have revealed their evidence throughout the ages in a variety of regions throughout the Mid East and Europe. Fast forward to the late 1800’s, peas were one of the first vegetables to be canned by the Campbell Soup Company, though that wasn’t their finest presentation. 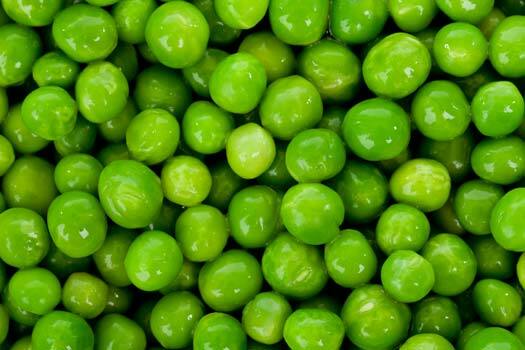 Peas were much more palatable as a frozen vegetable, introduced about 50 years later. Peas are nitrogen-fixing plants. That means they absorb—or “fix”—a portion of the nitrogen they need from the air. When the plants have finished growing and are left to decompose in the garden, their nitrogen will be returned to the soil to help companion and future crops. Full sun or light shade (6-8 hours sunlight minimum). Keep soil consistently moist (but not soaked) when seeds are first planted. After the plants start to grow, they prefer deep, regular, infrequent watering. Average soil with added organic matter. Soil pH should be 5.5–6.8. Peas require warm soil temperatures to grow: 70° and above. Young pea plants can tolerate frost so the seeds can be direct sown outside relatively early in spring when the soil and average ambient air temperature are above 40°F. Direct sow plant seeds according to seed packet instructions. Time from sowing to germination depends on soil temperature. Warmer=faster. Approximately 60 days after planting (depending on air temperature). Peas are light feeders; it is unnecessary to fertilize them. Mulch is helpful in order to keep the soil cool and moist. Peas are naturally pest resistant; keep an eye out for aphids. Peas prefer the cool weather of early spring and fall and will stop producing in the heat of summer. Rotate crops every year or two. These plants will be aided by the availability of nitrogen in the soil: Beans, carrots, corn, cucumbers, eggplant, peppers, and radishes. Onions are not a good companion and will stunt the peas’ growth. Yes, in a large container. Be sure to keep them well watered. Harvest as soon as the pods fill out and start to look plump. And, remember, the more you pick, the more pods will develop. Harvested pods can be stored in the coolest part of the fridge for about a week or so. Each of our three pea plant varieties thrives in the cool temperatures of early spring and fall. Sow the seeds in very early spring and late summer for two crops in one season. Peas will stop producing in hot weather so be sure to plant them early enough to reap a full harvest before the onset of soaring mid-summer temperatures. Sow pea seeds directly in the outdoor garden; they don’t transplant well. Pick frequently at maturity to encourage production of new pods. Peas are good for you—high in fiber and chockablock full of various nutrients such as vitamins K, C, and A, as well as thiamin and folate and carotenoid phytonutrients to promote eye health and vision.